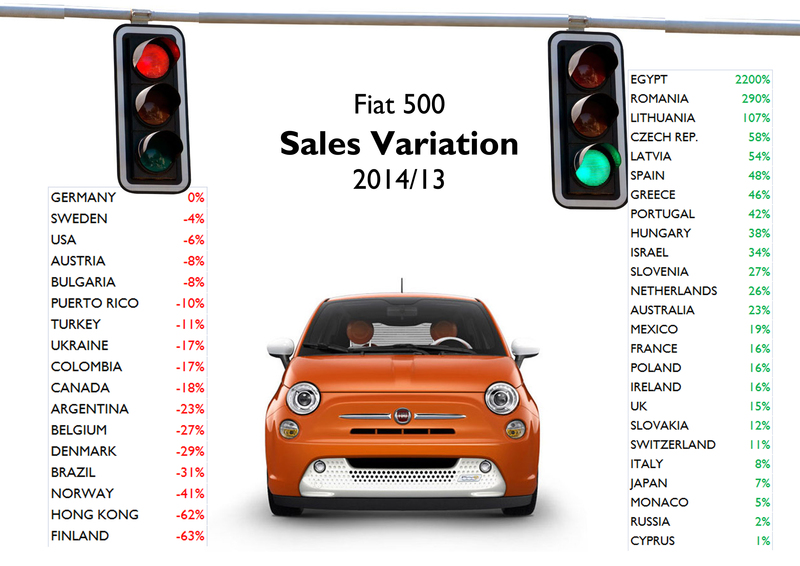 Once again the Fiat 500 impresses with its good sales results. Despite its age (in 2014 it turned 7 years without any important update), the small city-car continues to enlarge its success worldwide and keeping its place as the most global Fiat branded product on earth. 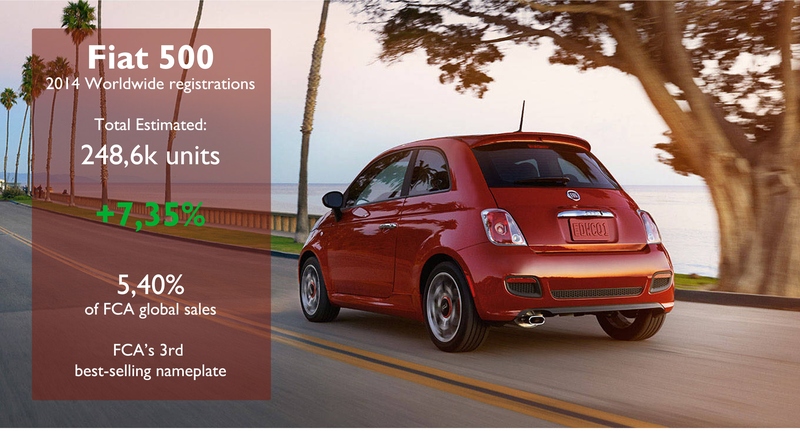 Last year FCA was able to sell around 249.000 units of the Fiat 500 in all versions and prices (Cabrio and Abarth versions included; 500L and 500X excluded). That number is the result of data collection for 44 countries and estimated figures for the remaining ones. 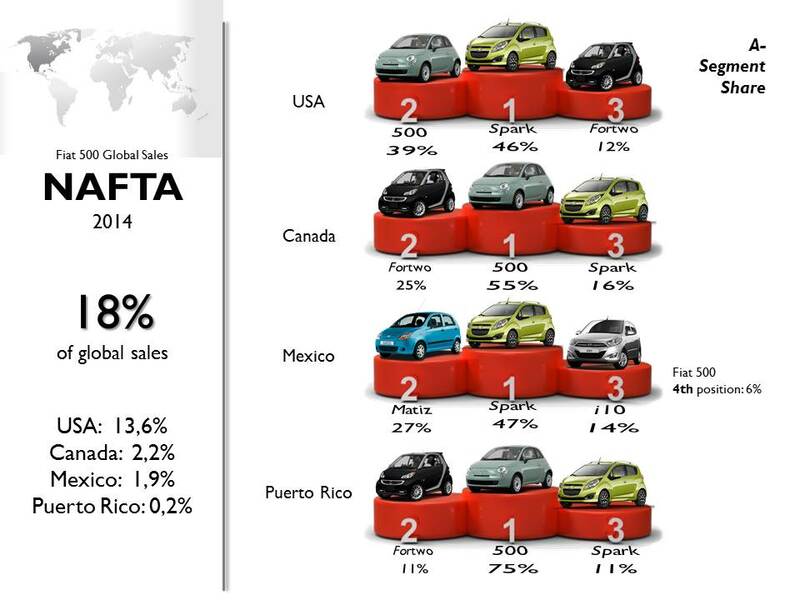 That’s 7,4% more than previous year and counts for 5,4% of FCA global sales. 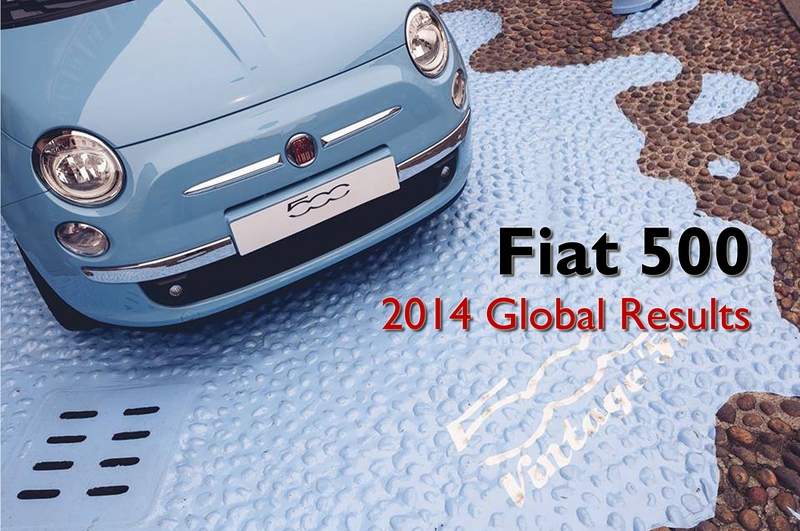 Hence it is one of the top 5 best-sellers of the group and a key product for the Fiat brand plans in the coming years. It is also one of the nameplates with the most balanced sales by countries, due in part to the good demand it has in Europe, North America and some APAC countries. 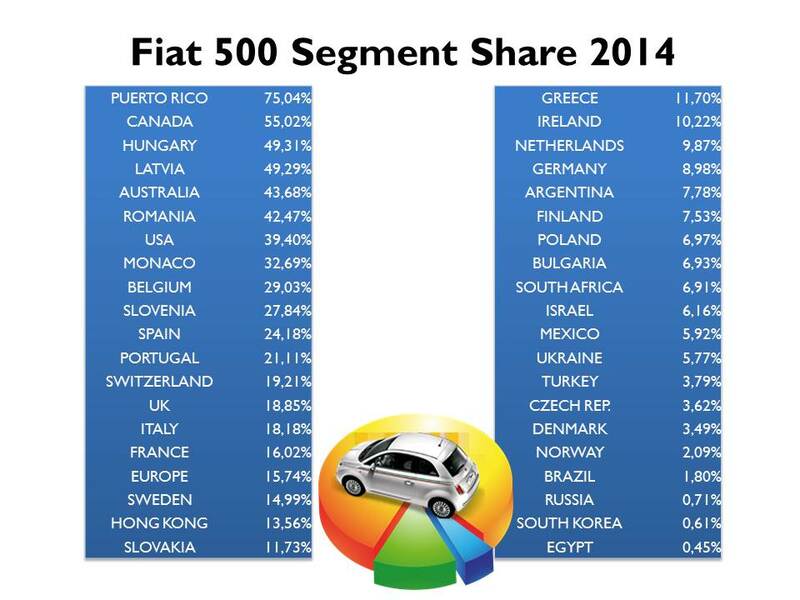 In 2014 Europe counted for 73% of total sales with 2 markets that love this car: Italy and the UK. 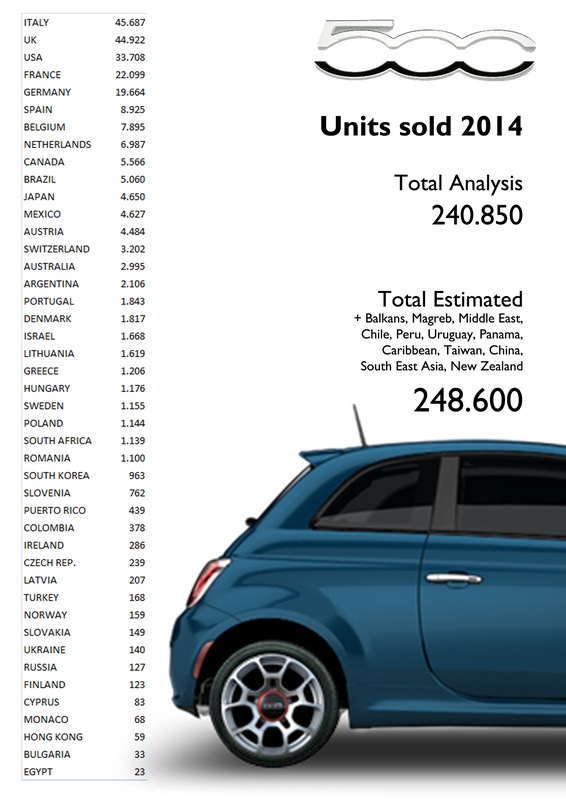 The homeland was the largest single market for the Fiat 500, but the UK wasn’t too far and stayed behind at only 765 units. In fact the British demand posted a higher growth than the Italian one. 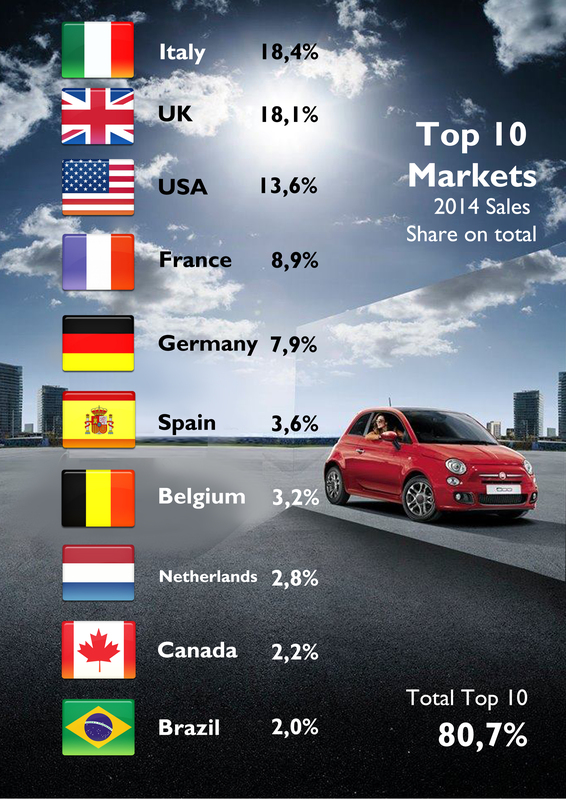 France outsold Germany (estimated) thanks to a solid growth that took place the same year the new Renault Twingo, Citroen C1 and Peugeot 108 were launched in their homeland. However the big jump came from Spain where the rent-a-car companies contributed to the outstanding results, up a massive 48%. The same happened in the Netherlands, Portugal, Israel, Lithuania (the only country where the 500 is #1), Greece and Hungary. In the opposite side there are Belgium, Austria and Denmark (Danish love the VW Up! ), where sales didn’t go well. 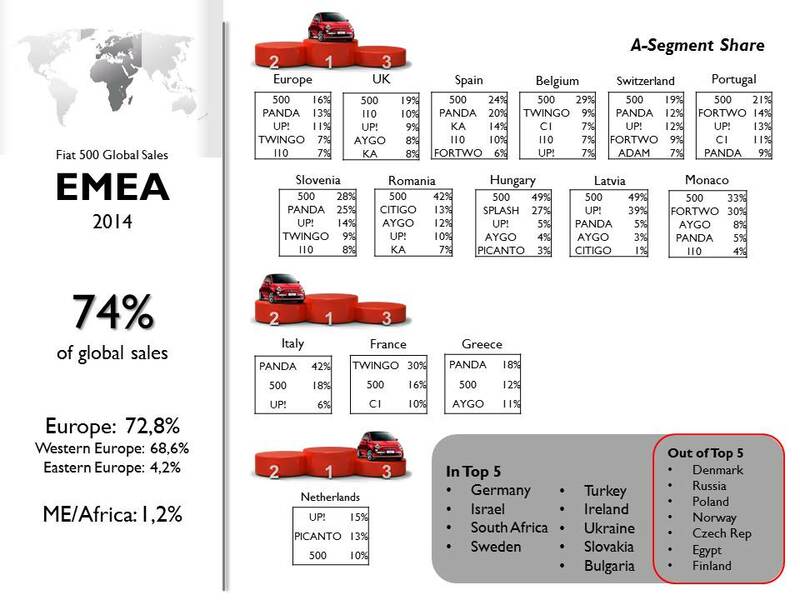 A new record of 181.000 units were sold in Europe in 2014 (Turkey and Russia included). North America is the second region by volume but there the results were not positive at all. Tougher competition, lower gas prices and the lack of news coming from the Fiat range, had a negative effect on the demand of the small Fiat. In USA, the world’s third largest market for the 500, sales continued to fall for the second year in a row, after reaching a peak in 2012. That’s how registrations fell 6% to 34k units and will continue to do it (in 2015-H1 total sales shrunk 15%). In Canada the situation was even worse, down 18%, whereas in Mexico, where the 500 is manufactured at Toluca plant, the demand soared a solid 19%. At the end the restyling the company just revealed some weeks ago is more urgent to be introduced in North America than in Europe. 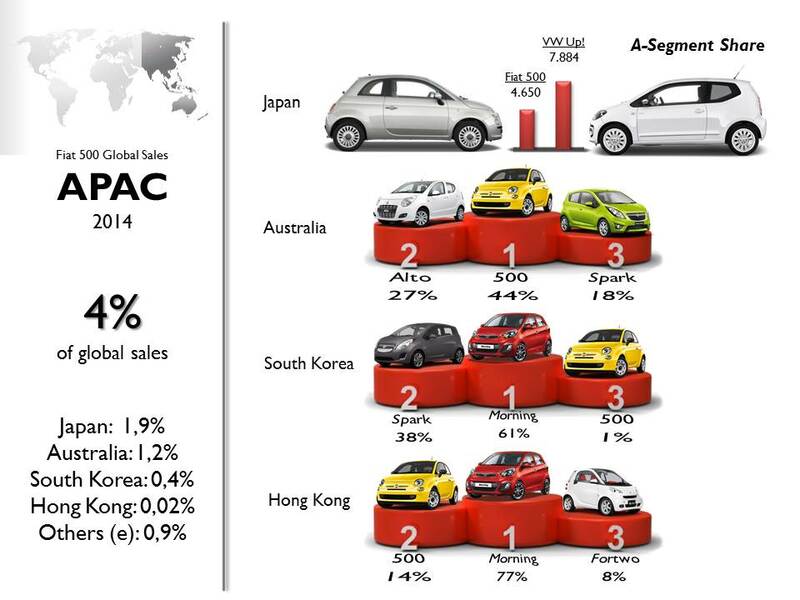 Due to the bad situation in South American economies, last year APAC region outpaced LATAM and became the third most relevant for the Fiat 500. In fact the data shows that the new national sales company established in Australia had a very positive impact on the demand for the Fiat and Alfa Romeos during 2014. In Japan the demand has been stable for years at 4k-5k units/year, and in South Korea where the brand debuted last year, the 500 became the best-selling Fiat and the 4th best-seller of the group. There’s no data for China and some other South East Asian nations. In Latin America (Mexico excluded) total sales didn’t surpass the 10k units barrier mostly because of the taxation problems in Argentina and the economic crisis in Brazil. Despite these problems, Fiat continues to sell the 500 and it has even enlarged the range with the Abarth versions which in some cases is priced at $26.000. The currency fluctuations have also affected the prices of the Mexican made Fiat 500. Even if some countries like Colombia signed free trade agreements with Mexico, the imported cars in Latin America are becoming more and more expensive. Just a small ajust Juan! 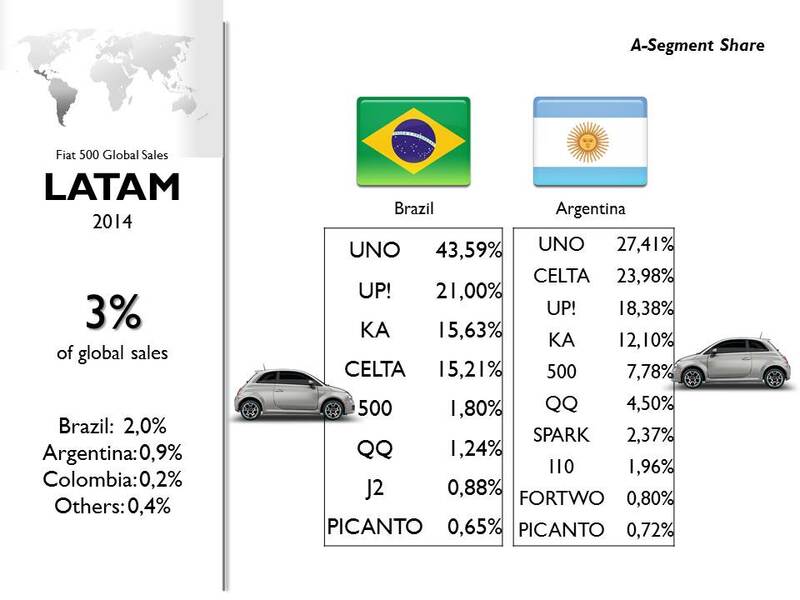 In Brasile, Fiat 500 is not considered a rival of Uno or even Up! Due its prestige, value and building its above up!, Uno and even Palio (range of prices). That’s explain much about low sales here. If we had cheaper versions of 500 like Up!, it could sell much more. I know but in terms of dimensions they are all part of the same segment. Pricing and positioning is different but they are all city-cars.